People often consider shrubs as slightly dull background plants, but they can be a lot more exciting than this, and very useful too. They are generally easy to care for; they give structure and substance to a garden, and they provide colour through the year. I’ve just completed a planting plan for a family garden, that mostly consists of shrubs. My clients are a couple with 3 children of different ages who have visitors from their extended family, also with small children. They have a busy life and wanted a low-maintenance garden based around shrubs, including some evergreens for winter interest. They also wanted a new tree to screen views of nearby houses, and wanted advice on whether to keep a large cherry tree which had not, so far, flowered. The garden would have a simple layout of three beds, a lawn and a south-east facing patio. The photo below shows the existing garden – the paved area on the right is to be replaced by lawn. I started with the existing trees. There was a magnolia on the left, which looked promising. The cherry did not seem in the right place to provide privacy and screening, so I looked at other trees instead. After some juggling of trees and shrubs, I came up with planting two multi-stem silver birches in the right hand back corner. These will look lovely all year round, with their white peeling bark, catkins and delicate leaves and branches. Having two trees together is not usually a good idea – things look better as singles or in threes – but these trees would be balanced by a new tree in the left-hand corner, a cercis canadensis ‘Forest Pansy’. This has small purple leaves and pink spring flowers, and would both screen the view (particularly from spring to autumn) and enhance the sinuous stems of the magnolia in front of it. I included several evergreen shrubs to provide structure. A Ceanothus is in a sunny front corner on the left-hand side, providing blue flowers in summer. Near the left-hand back corner there is a Pittosporum ‘Elizabeth’, which has grey-green leaves margined white with a pink flush, that tone with the Cercis behind it. An existing pyracantha has been moved to the centre of the back fence; it bears abundant flowers and berries, feeding the wildlife and giving seasonal colour. In the shady bed on the right there are three larger shrubs: a choisya, a mahonia the client liked, and a climbing variegated euonymus ‘Silver Queen’ in between to lighten up the shade. 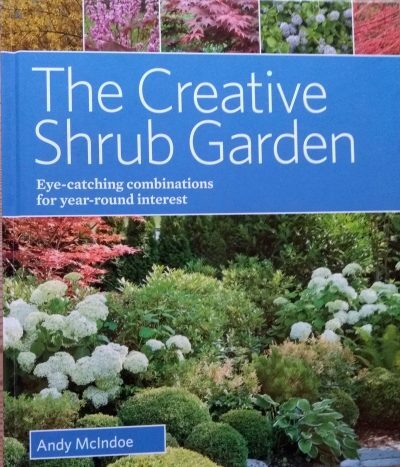 I found a lovely combination of 3 smaller shrubs in a very useful book for any gardener: ‘The Creative Shrub Garden’ by Andy McIndoe. He suggests them for creating an ‘exotic’ feel; I chose them because they went with the Buddha statue and stones that my clients wanted incorporated into the design, and also because they suit the acid soil and are low-maintenance plants with year-round interest. They are: nandina domestica, leucothoe keiskei ‘Royal Ruby’ and rhododendron ‘Blue Danube’. The first two plants tone together and have winter tints of red or purple, which is a nice contrast for the birch trunks and the Buddha/stones. The rhododendron has large purple flowers which tone nicely with the red and purple of the other two plants. For flowering evergreen ground cover, there are creeping periwinkles (vinca minor) and bergenia ‘Bressingham Ruby’. On the left hand fence, there is a climbing rose ‘Tess of the D’Urbervilles’, with bold red flowers. Two clematis, macropetala ‘Lagoon’ and ‘Jackmanii’, provide flowers in spring and summer. A dogwood, cornus alba sibirica ‘Variegata’, has green and white variegated leaves which tone with the white birch trunks; when cut back in March, the new red stems will be a lovely feature in winter. Lastly, a purple/pink berberis thunbergii ‘Rose Glow’ on the right balances the purple cercis on the left side of the garden. My clients like bold colours, so I used oranges, reds and purples. I used spring bulbs for shots of bold colour: narcissus ‘Tete a Tete’ and the orange tulip ‘Ballerina’. An orange crocosmia, an existing red and white salvia ‘Hot Lips’ and a red daylily or hemerocallis feature in the sunny left-hand bed, while at the back there are some orange geums and long-flowering violet-blue geranium ‘Rozanne’.